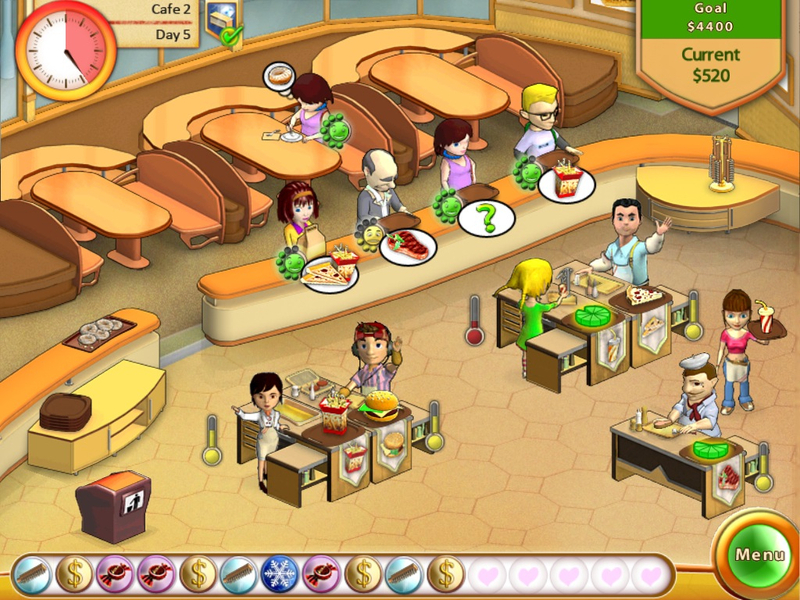 Amelie’s Cafe HD is an attractive but uninspired time management (TM) game that falls short of realizing its potential. The secret to a good time management game is how it conceptualizes its core gameplay. The likes of Diner Dash practically invented the genre and since then, there have been many ways to improve and innovate on the time management formula. Let’s see how Amelie’s Cafe HD stacks up. The storyline behind the game is familiar to anyone who’s played a TM game or two. As Amelie, you run a restaurant business that serves a variety of dishes, closer to casual dining fare than a cafe, really, such as pizzas, fries, burgers and steak. You take orders from a variety of customers, and have several cooks at your disposal, mainly limited to churning out one unit of food at any given time. These dishes can be combined depending on the customer’s order. More often than not you have to constantly instruct your cooks to keep making food. These cooks, however, tend to make a huge mess, so you also have to make sure their workstations are periodically clean – otherwise, they are not productive. Also, since they tend to slow down as their workstations get dirtier, you have to manage a growing queue of impatient customers. There are power ups that are constantly coming, and you can activate them any time to save yourself some time and trouble. This is more or less what the game is about, and there aren’t any upgradeable items or equipment, or much variation in the gameplay. There are three main locations and two game modes, story and survival. There isn’t much difference between these locations nor a significant progression in terms of difficulty. Controls are quite clunky, and while your cooks can move marginally faster if you chain actions successively, the implementation of the mechanics is awkward. There is little strategy here, only constant tapping and rather tedious trips from one station to another. Loading times are slow and the app is prone to crashing, making it quite a chore to load the game again. For a time management game, Amelie’s Cafe HD is not up to par in terms of polish and replayability. The graphics are nice but not too distinctive, and I could say the same for the music and effects. Gameplay gets monotonous and repetitive quickly, and there’s little incentive to keep going. While TM games do revolve around a successful system of chaining actions and performing tasks efficiently, rinse, and repeat – many TM games have found a way to inject strategy, humor and fun into the game. I am hard pressed to recommend this game until there are significant improvements, if not an overhaul. TM fans and newbies may want to look elsewhere, or test drive the lite version.